Among the highlights of our recent road trip were two nights of star gazing. In Utah I was amazed to see subtle color in the stars, so for this painting I included some of that starlight color: yellow-gold for Capella, red for Algol, orange and blue-green for the Arnath. Perseus, Cassiopia, Taurus, and a bit of Orion are all in here, as well as the Seven Sisters of Pleiades and the luminous river of the Milky Way reaching up from the horizon. These are winter constellations around here – not ones we saw on our trip, but I’ve been meaning to painting Pleiades for a while now. In astronomy, the Pleiades, or Seven Sisters, is an open star cluster located in the constellation of Taurus… It is among the nearest star clusters to Earth and is the cluster most obvious to the naked eye in the night sky… The Pleiades are a prominent sight in winter in the Northern Hemisphere and in summer in the Southern Hemisphere. The cluster contains over 1,000 statistically confirmed members, although this figure excludes unresolved binary stars. It is dominated by young, hot blue stars that have formed within the last 100 million years, up to 14 of which can be seen with the naked eye depending on local observing conditions. 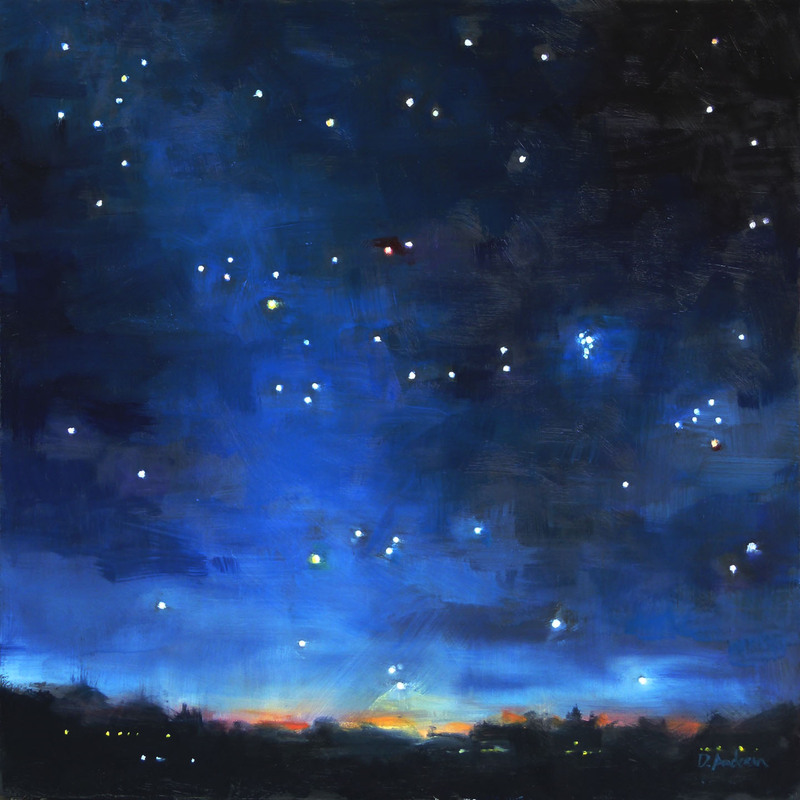 This entry was posted in landscape, oil and tagged Deb Anderson, landscape, night sky, nocturne, oil painting, pleiades, stars.